The quick and easy solution to the removal of body spillages for every day accidents and spillages. Ideal for Nursing Homes, Schools and Taxi/Private Hire Drivers. The quick and easy solution to the removal of body spillages. Combining the absorption power of Sanitaire with the germicidal and odour neutralizing efficacy of Sta-kill. 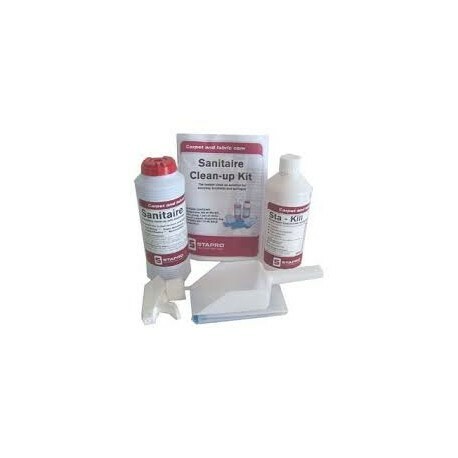 Our Clean-Up Kits come in a handy pack containing latex gloves, a scoop and a tough disposal bag so accidental body spills can be cleaned-away safely and efficiently.